Alphonse Gabriel “Al” Capone was a notorious American gangster who led the Prohibition-era crime syndicate, the Chicago Outfit, which became known as the "Capones," a group responsible for smuggling and bootlegging liquor, and other illegal activities such as prostitution, in Chicago from the early 1920s to 1931. Born in Brooklyn in New York City to Italian immigrants, Capone became involved with gang activity at a young age after being expelled from school at age 14. In his early twenties, he moved to Chicago to make a living smuggling alcoholic into the city during Prohibition, and as such he was involved in such other illegal activities, like bribing government officials. 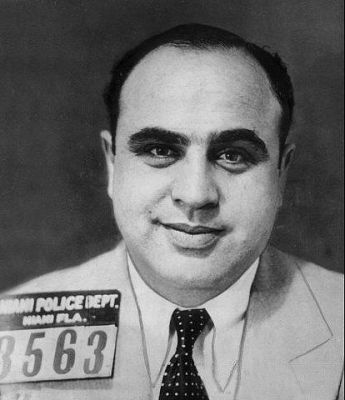 Despite his gang involvement, Capone became a beloved public figure, making donations to various charitable endeavors using the money he made from his illegal endeavors, which is why he was viewed by many to be a “modern-day Robin Hood.” Capone's public reputation was damaged after his supposed involvement in the 1929 Saint Valentine's Day Massacre, where seven rival gang members were executed. Capone was convicted on federal charges of tax evasion in 1931 and sentenced to federal prison; he was released on parole in 1939. His incarceration included a term at the then-new Alcatraz federal prison. In his final years, Capone suffered mental and physical deterioration due to late-stage neurosyphilis, which he had contracted in his youth. On January 25, 1947, he died from cardiac arrest after suffering a stroke. As one of America’s most famous gangsters, Capone has been the subject of numerous books and films. The stereotypical image of a mobster wearing a blue pinstriped suit and tilted fedora is based on photos of Capone. Moose Jaw, a city that, back in the 1920s, was famous for gambling, prostitution and bootlegging, had a direct rail connection to Chicago, known as the Soo Line. This direct link to the Windy City and the celebrity of Capone himself may have sparked rumours of the gangster’s visits to the small Canadian prairie city. It would have been an easy yarn to spin. But the many stories of Capone in Moose Jaw and other parts of Saskatchewan are many and independent of each other, and told by respectable families, some ashamed to have met such a man and weary to tell their tales. Although a Chicago syndicate headed by Al’s brother, Ralph, supposedly owned 20 airplanes that regularly flew into Canada to pick up liquor. Capone was a gangster. If he was ever north of the border, he likely would have been careful to cover his tracks and keep his presence in Canada secret. So the evidence trail that connects him to Moose Jaw is a short one.